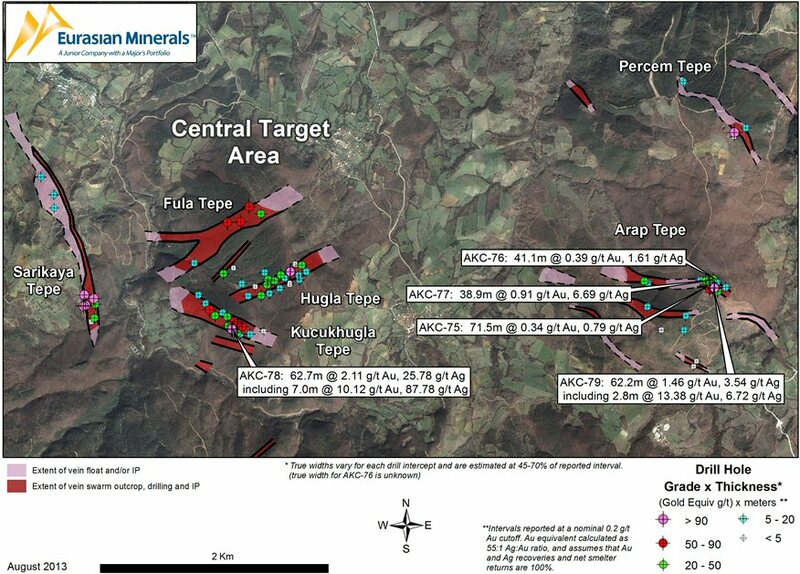 Eurasian Minerals Inc. (TSX VENTURE:EMX)(NYSE MKT:EMXX) (the "Company" or "EMX") is pleased to announce initial drill results from the Akarca gold-silver project that include an oxide intercept of 62.7 meters averaging 2.11 g/t gold and 25.78 g/t silver, with a higher grade sub-interval of 7.0 meters averaging 10.12 g/t gold and 87.78 g/t silver. These results were reported to EMX by Colakoglu Ticari Yatirim A.S. ("Colakoglu"), a privately owned Turkish company that signed an option agreement in June to buy the property for a combination of cash payments, gold bullion, work commitments, and a royalty interest. Colakoglu is aggressively advancing Akarca towards resource delineation while exploring for new discoveries on the property, and currently has three drill rigs on site. Akarca Drill Results. Colakoglu recently provided results to EMX from five core holes totaling approximately 560 meters. The current program is systematically stepping-out along strike and down-dip from the known gold-silver zones to drill define the grade and tonnage characteristics of the mineralization. At this early stage, Colakoglu is successfully confirming the near-surface, oxide mineralized zones at the Arap Tepe and Kucukhugla Tepe prospects. Drill hole AKC-78 returned the best intercept to date at Kucukhugla Tepe, and intersected higher grade vein-style, as well as disseminated-style mineralization in silicified wall rocks. The drill program is ongoing, with initial results summarized in the table below (also see attached map, visit the following link: http://media3.marketwire.com/docs/Eurasian_Minerals_Drill_Program.jpg). AKC-75       1.0  72.5     71.5  0.34   0.79  0.35 Arap Tepe, TD = 119.4 m.
AKC-76       2.5  43.6     41.1  0.39   1.61  0.42 Arap Tepe, TD = 130.2 m.
AKC-77      13.3  52.2     38.9  0.91   6.69  1.03 Arap Tepe, TD = 96.2 m.
AKC-79       6.6  68.8     62.2  1.46   3.54  1.53 Arap Tepe, TD = 104.0 m.
and net smelter returns are 100%. Commercial Terms Overview. On June 10, 2013 (the "Agreement Date"), the Company entered into an option agreement (the "Agreement") to sell the Akarca property for a combination of cash payments, gold bullion, work commitments, and a royalty interest. The Agreement gives Colakoglu the option to acquire EMX's 100% owned subsidiary, AES Madencilik A.S. ("AES Turkey"), a Turkish corporation that controls the Akarca property. The Agreement requires Colakoglu to make an up-front payment of US$250,000 (received). The option cannot be exercised until 18 months after the Agreement Date. In order to exercise the option, Colakoglu must drill at least 5,000 meters within one year of the Agreement Date, and pay US$500,000. After exercise of the option, subject to a right to terminate the Agreement and return the shares of AES Turkey to the Company, Colakoglu must make additional cash payments of US$4,250,000 over a period of three years and drill a cumulative 20,000 meters over a period of four years after the Agreement Date, must deliver up to 18,000 troy ounces of gold under certain terms and conditions and, within 180 days after request by EMX after the sixth anniversary of the Agreement Date, if commercial production has not already commenced, deliver a feasibility study. The Company will retain a 3.5% Net Smelter Return (NSR) royalty on any production from the property. This royalty is uncapped, cannot be bought down, and none of the pre-production cash or bullion payments count as advanced royalty payments. Akarca Property Overview. The Akarca project consists of six epithermal gold-silver mineralized zones occurring within a district-scale area. EMX's initial grassroots discovery and exploration successes led to a joint venture with a subsidiary of Centerra Gold Inc. ("Centerra") in 2009, with Centerra subsequently earning an initial 50% interest in Akarca as a result of investing over US$5 million in drilling, geological mapping, geochemical sampling, and geophysical surveys. EMX negotiated to regain 100% control of the property later in 2012 (see Company news release dated October 30, 2012). Less than 20% of the 14,000 meters of vein target strike length as currently defined by mapping and IP-resistivity anomalies have been drill tested to date. Comments on Sampling, Assaying, and QA/QC. The Akarca exploration programs are conducted under the supervision of Dr. Mesut Solyu, CPG, Head of Exploration for Colakoglu. Colakoglu's drill samples were collected in accordance with accepted industry best practice guidelines, and follow the procedures and protocols originally established by EMX for the Akarca project. The samples were submitted to ALS Chemex laboratories in Izmir, Turkey (ISO 9001:2000) and Vancouver, Canada (ISO 9001:2000 and 17025:2005 accredited) for sample preparation and analysis. Gold was analyzed by fire assay with an AAS finish, and silver underwent aqua regia digestion and analysis with MS/AES techniques. Over limit assays for gold (greater than 10 g/t Au) were conducted with fire assay and a gravimetric finish, and over limit analyses for silver (greater than 100 g/t Ag) were performed with aqua regia digestion and ICP/AES techniques. As standard procedure, Colakoglu carries out routine QA/QC analysis on all assay results, including the systematic utilization of certified reference materials, blanks, and duplicate samples. About EMX. Eurasian is a global gold and copper exploration company utilizing a partnership business model to explore the world's most promising and underexplored mineral belts. Eurasian generates wealth via grassroots prospect generation, strategic acquisition and royalty growth. This news release may contain "forward looking statements" that reflect the Company's current expectations and projections about its future results. When used in this news release, words such as "estimate," "intend," "expect," "anticipate," "will" and similar expressions are intended to identify forward-looking statements, which, by their very nature, are not guarantees of the Company's future operational or financial performance, and are subject to risks and uncertainties and other factors that could cause Eurasian's actual results, performance, prospects or opportunities to differ materially from those expressed in, or implied by, these forward-looking statements. These risks, uncertainties and factors may include, but are not limited to: unavailability of financing, failure to identify commercially viable mineral reserves, fluctuations in the market valuation for commodities, difficulties in obtaining required approvals for the development of a mineral project, increased regulatory compliance costs, expectations of project funding by joint venture partners and other factors. Readers are cautioned not to place undue reliance on these forward-looking statements, which speak only as of the date of this news release or as of the date otherwise specifically indicated herein. Due to risks and uncertainties, including the risks and uncertainties identified in this news release, and other risk factors and forward-looking statements listed in the Company's MD&A for the six-month period ended June 30, 2013 (the "MD&A") and most recently filed Annual Information Form for the year ended period ended December 31, 2012 (the "AIF"), actual events may differ materially from current expectations. More information about the Company, including the MD&A, the AIF and financial statements of the Company, is available on SEDAR at www.sedar.com and on the SEC's EDGAR website at www.sec.gov.